Previously, we asked if the iPad Mini would be a good move for Appleand it looks like public reaction these rumors and increasing investor interest point to a definite yes. With major news outlets such as The Wall Street Journal all but confirming the existence of the iPad Mini, Apple enjoyed one of its best week in months. A report from Seeking Alphashares that after rumors about the iPad Mini started spreading like wildfire, Apple’s stocks surged from $572 to $612 on Thursday. It eventually settled down to $605 on Friday. “In response to a question regarding iPad cannibalization of MacBooks, then COO Tim Cook responded ‘was there any cannibalization? Honestly, I don’t know for sure. But yes, I think there is some cannibalization… If this is cannibalization, it feels pretty good.’…One of Apple’s greatest strengths is its willingness to cannibalize its own products before competitors simply overtake them. Cannibalization has become such a vilified term in business but it generally just describes a company with the foresight to adapt before competitors do. For example, does the iPod touch cannibalize sales of the other iPods and the iPhone? Yes it does. 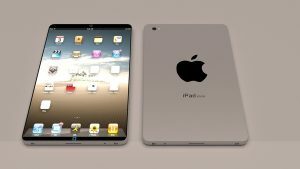 The iPad Mini is rumored to be a 7-inch tablet and will directly go up against Samsung’s Galaxy Tab, Amazon’s Kindle Fire and possibly Microsoft’s recently announced Surface. It is expected to be unveiled together with the iPhone 5 sometime this fall.